After reviewing the Belkin USB Plus 7-port Hub earlier this month, I thought it would only be appropriate if I also reviewed it’s smaller sibling the 4-port USB Plus Hub. 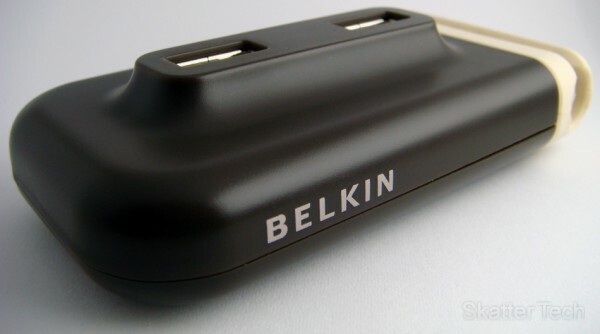 The Belkin 4-port hub retains the same style and theme as the larger one. It accepts power from an AC Adapter so too much stress won’t be placed on your machine’s bus. And since it’s self powered, as a bonus, USB powered devices can be charged if connected to the hub even when your computer is off. A neat little rubber clamp on the right side acts as a holster to keep cables neatly organized and from running loose. The Belkin 4-port USB Plus Hub worked without any issues with just about any USB gizmo. 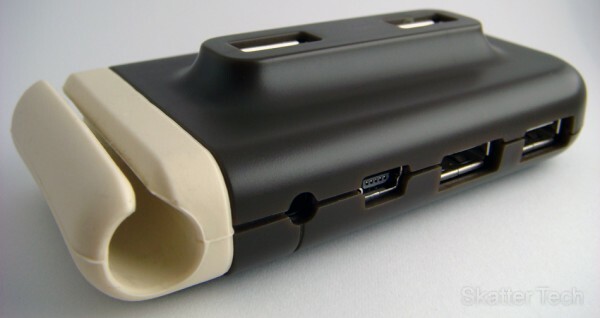 Two of the USB ports along with the input and power supply are found on the back. For easy access, the remaining two ports have been placed on top of the unit for flash drives. There are LED indicators embedded into the casing, which indicate which ports are connected and when the power supply status. The hub was able to retain a full data throughput that the USB can support, which is all that we can ask for. It will slow down if too many data intensive devices such as external Hard Drives are being used. The hub is available in two color schemes: brown/white or white/blue. As seen in the pictures, I went with the brown/white configuration to match my other gizmos; however people who own Apple gizmos might want to go with the white/blue. I tested this unit with both Windows Vista and Mac OS X Leopard without any issues whatsoever. Overall the hub is well designed and works smoothly. It is now available online (amazon, newegg, etc.) and in most retail stores for around $29.99.